Introduction: Alzheimer's disease (AD) is a progressive neurologic disorder that leads to the irreversible loss of neurons. Amyloid plaques and loss of cholinergic neurons are two main characteristics of AD. In AD, the action of neurotransmitter, acetylcholine, is terminated by acetylcholinesterase (AChE) present in the synaptic cleft, and formation of amyloid plaques in the synapse prevents acetylcholine to reach their receptors on the postsynaptic neurons. Over the years, scientists have discovered various classes of the molecules for treatment of the disease and some are derived from plants such as rivastigmine, huperzine, and galantamine. Numerous plants are being used traditionally as treatment for neurodegenerative diseases such as AD, anti-aging, and preventing dementia. Among these indigenous plants, Terminalia chebula (Tc) is regarded to slow down the aging process and to improve the cognition in the traditional age-old practices. Objective: In this study, we have assayed the methanolic extract of Tc leaves to assess its inhibitory effect on four different pathways related to AD. Materials and Methods: Ellman method was used to measure the effect of Tc on AChE activity. To assess the effect of Tc on amyloid-β (Aβ)-secretion pathway, we measured the amount of Aβ40 in cell culture medium using ELISA Kit. Aβ-aggregation (40 and 42) and disruption of Aβ-aggregates (40 and 42) were monitored using a fluorescence technique, Thioflavin-T, in vitro. Results: Our results show that Tc has significant inhibitory effect on all the above-mentioned assays, with the best IC50 = 10.3 μg/ml for Aβ40-aggregation followed by Aβ42-aggregation (IC50 = 18.6 μg/ml), disruption of Aβ40-aggregates (IC50 = 41.8 μg/ml), disruption of Aβ42-aggregates (IC50 = 132.2 μg/ml), and AChE activity (IC50 = 200 μg/ml). Besides, it showed 21.46% inhibition on Aβ40 level in HEK293 cell line. Abbreviations used: AD: Alzheimer's disease, Tc: Terminalia chebula, AChE: acetylcholinesterase, Aβ: Amyloid-β, APP: Amyloid precursor protein. 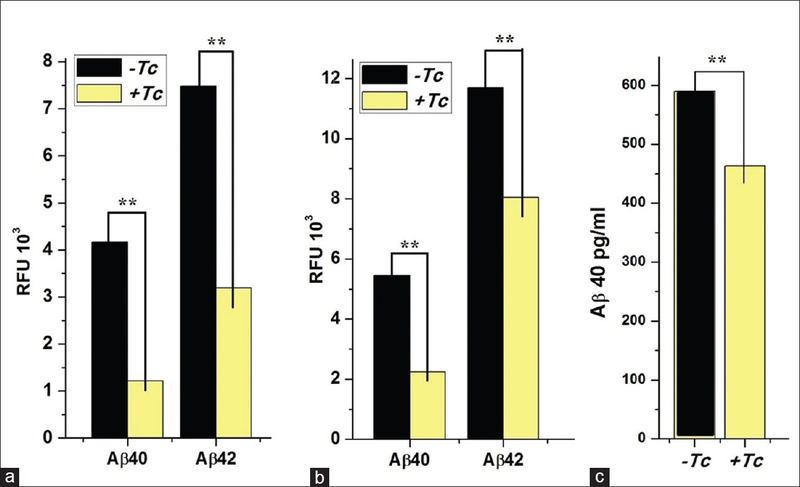 Methanol extract of Tc leaves has significant inhibitory effect on Aβ-aggregation (Aβ40 and Aβ42). Methanol extract of Tc leaves has significant effect on disruption of Aβ-aggregates (Aβ40 and Aβ42). Methanol extract of Tc leaves reduces AChE activity significantly. 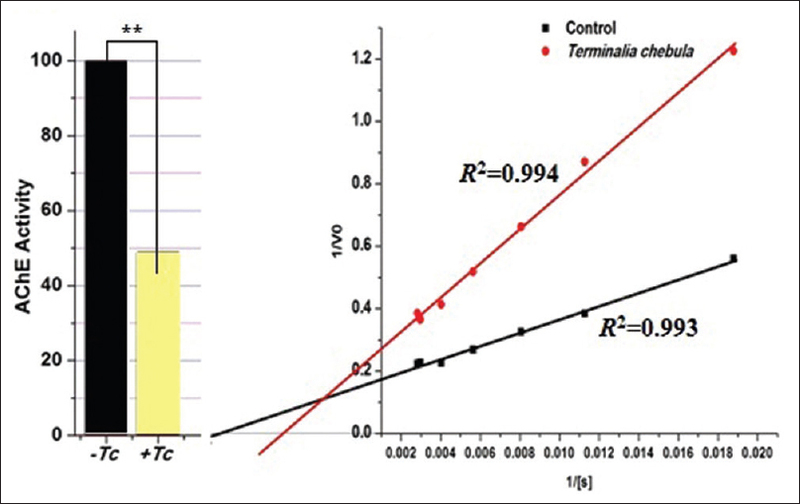 Methanol extract of Tc leaves shows significant reduction on Aβ40 level in HEK 293 cell line. Alzheimer's disease (AD), the most common form of dementia, is a progressive neurologic disorder of the brain that leads to irreversible loss of neurons. AD impairs cognitive and memory functions, communication, personality, behavior, and ability to function properly., Due to the absence of a permanent cure, AD has become a major health problem, although there are some treatments that may slow down its advances. Neurofibrillary tangles, amyloid plaques, and loss of cholinergic neurons are three pathological markers commonly observed in the cerebral cortex of AD cases., Based on the findings that there exists a correlation between cholinergic system abnormalities and intellectual impairment, “cholinergic hypothesis” has been put forward in the functioning of memory and accepted as the foremost hypothesis in the field of AD., The neurotransmitter, acetylcholine, is involved in active maintenance of novel information and enhancement of long-term potentiation, i.e., memory. The action of acetylcholine is terminated in the synaptic cleft by acetylcholinesterase (AChE). Amyloid plaque formation in synapse prevents acetylcholine molecules to reach its cognate receptors on the postsynaptic neuronal membrane, thereby leading to the gradual loss of communication between neurons. Amyloid plaques are extracellular lesions which are composed of small peptides, 40–42 amino acids, called amyloid-β (Aβ). Aβ is accumulated in synapses and is a part of a transmembrane protein, amyloid precursor protein (APP). Biologically, accumulation of neurotoxic Aβ is one of the major hallmarks of AD. Pathway through which APP is cleaved to produce Aβs has well been identified. Three proteases, α-secretase, β-secretase, and γ-secretase, are involved in the processing of APP. α-secretases cleave APP and produce soluble N-terminal fragment (sAPPα) and C-terminal fragment (CTF) (83 a.a.), APP-CTFα, which in turn is either degraded in lysosome or further cleaved by γ-secretase.,,, Alternatively, APP may be cleaved by β-secretase where it generates smaller insoluble sAPPβ (N-terminal) and a C-terminal (C99) that subsequently cleaved by γ-secretase. Due to two cleavage sites, γ-secretase produces two neurotoxic peptides, Aβ40 and Aβ42. Over the years, several studies have focused on “cholinergic hypothesis” to ameliorate the acetylcholine deficiency in the brain of AD patients. These endeavors have led the scientists to discover various classes of molecules, for the treatment of AD, in the form of acetylcholine esterase inhibitors. Some of these drugs have been derived from plants such as rivastigmine, huperzine, and galantamine., However, these drugs only slow down the progression of the disease and have been reported for various side effects such as gastrointestinal disturbances and bioavailability problems., These disadvantages make a room for finding newer drugs with better efficacy on AChE while having effect on other pathways of AD in which Aβ is produced or aggregated. Terminalia. Chebula Retz., with synonyms such as Myrobalanus chebula (Retz) Gaert., Terminalia acuta Walp., or Terminalia reticulate Roth., which belongs to the family, Combretaceae, is found in South East Asia such as India, Bhutan, Nepal, Bangladesh, and Myanmar. This plant has been used as a traditional medicine against many diseases including fever, cough, diarrhea, gastroenteritis, skin diseases, and candidiasis in Ayurvedic system. Besides, antibacterial, anti-inflammatory, anticancer, antioxidant, and neuroprotective activities of Tc have been reported., Given that many current AD drugs are derived from plants and Tc is regarded to slow down the aging process and to improve the cognition, it would be justifiable to explore whether this plant used in the traditional tribal knowledge might contain some compounds that may limit the various enzymatic and nonenzymatic pathways leading to AD. To this end, we have assayed the methanol extract of Tc for its capacity to modulate AChE activity, Aβ-aggregation and Aβ-disruption, and Aβ-secretion. The plant displayed very exciting results. Under the aim of this study, Terminalia chebula (Tc) was collected from the garden of Botanical Survey of India (BSI) (Shillong, Meghalaya, India). Proper identification and authentication of the collected plant was carried out with the help of specialist from BSI, and respective voucher specimen was provided. The plant was first washed, dried gradually, and leaves of Tc were pulverized and transferred to bottle with some silica gel to protect them from moisture. The plant leaves were extracted using methanol. The leaf powder/solvent was used at the ratio of 1 g/20 ml. The mixture was kept at the temperature of 318 K overnight. The mixture was filtered using Whatman filter paper no. 40 (110 mm) gently. The solvents were removed using the evaporator, the extract was lyophilized, and finally the extract was sealed and kept at 4°C. The phosphate buffer 0.1 M was prepared at pH 7 and pH 8. AChE and acetylthiocholine (ATC) substrates were purchased from Sigma. The (5, 5'-dithiobis-[2-nitrobenzoic acid]) (DTNB) was obtained from SRL, India, and used as a reporter reagent. The final enzyme concentration of AChE was 0.058 U. Eight different final concentrations of ATC were adjusted ranging between 35.476 μM and 354.770 μM. The DTNB was used at a final concentration of 0.33 mM. The plant extract was used at four concentrations including 0, 200, 500, and 1000 μg/ml. 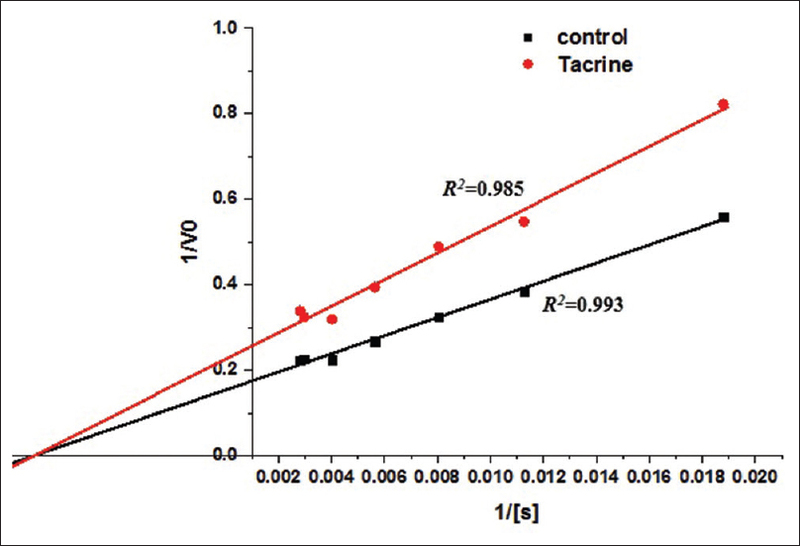 The first concentration (0) was considered as normal AChE-activity (negative control, no inhibition), and Tacrine (a known noncompetitive AChE inhibitor,,) was used as positive control of inhibition for assay validation [Figure 1]. The AChE activity was measured with the method developed by Ellman et al., 1961, and modified by Laura et al., 2010. The experiment was done in triplicate using 96-well plate and activity was measured at the wavelength of 412 nm using plate reader (Synergy H1, BioTek). Human amyloid beta peptide (abcam: ab120479 and ab120301) was prepared at a concentration of 1 mg/ml in 100% dimethyl sulfoxide (DMSO) following with sonication and centrifugation at 16,000 g for 10 min to remove fibrils. The supernatant was aliquoted and then kept at −80°C. Thioflavin-T (ThT) was used as a potent fluorescent marker of beta-sheet peptide, which when binds to Aβ-aggregates, its fluorescence intensity increases dramatically. Aβ was used at the concentration of ~10 μM in 10% DMSO buffer (pH: 7.6). The final concentration of ThT was 20 μM and we used plant extract at two concentrations including 25 and 50 μg/ml. The experiment was done in triplicate and excitation was adjusted at 440 nm. The emission was measured at 490 nm reading for at least 6 h at 37°C using Synergy H1, BioTek plate reader. The experiment was designed in the following manner: the normal aggregation, negative control (no Tc extract) contained buffer, ThT, and Aβ, while for inhibitory assay, Tc extract was added in addition to buffer, ThT and Aβ. Phenol red, a known aggregation inhibitor, was used as positive control for assay validation (data not shown). The reagent preparation was done as same as Aβ-aggregation assay. Aβ was used at the concentration of ~10 μM in 6% DMSO buffer (pH: 7.6) containing Aβ-aggregation buffer (accelerator). The final concentration of ThT was 20 μM. The reaction was preincubated at 37°C for 1 h following with addition of Tc extract at two concentrations; 30 μg/ml and 60 μg/ml. The experiment was done in triplicate and excitation was adjusted at 440 nm. The emission was measured at 490 nm reading for at least 6 h at 37°C using Synergy H1, BioTek plate reader. The experiment was designed in the following manner: the control (no Tc extract) contained buffer, ThT and Aβ, while for inhibitory assay, Tc extract was added in addition to buffer, ThT and Aβ. To measure the effect of Tc on enzymatic pathway through which Aβ is produced and secreted to synaptic cleft, we used Aβ40-ELISA Kit (Abcam: ab193692). HEK293 cell lines were used as they have been reported to produce Aβ. Cells were seeded in 6-well plate in high-glucose medium containing 10% fetal bovine serum, and when cells reached >90% confluency, the normal medium was replaced with free-style medium (Gibco: 12338-018). Using cell cytotoxicity assay kit (Abcam: ab112118), first we measured the cytotoxicity effect of Tc on the cell line. To measure level of Aβ40, medium was collected and tested 12 h posttreatment with Tc, vehicle (DMSO), and known inhibitor. The experiment was done in triplicate. Wells containing vehicle and γ-secretase inhibitor (2 μM) “L-685,458” (Abcam: ab141414) were used as negative and positive controls, respectively (data not shown). The plant extract was used at a concentration of 25 μg/ml. Origin Pro8 and Microsoft Excel were used to calculate percentage inhibition (%I), IC50, Vmax, Km, and to find the inhibition pattern. All experiments were done in triplicates and Dunnett's test was done to compare the means with ± standard division between inhibitory activity and normal activity (control) for each assay. Significant differences are shown at α = 0.01 level. 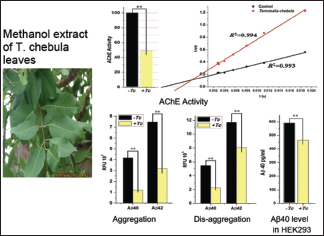 We used methanolic extract of Tc leaves to screen its inhibitory effect on AChE activity [Figure 2], Aβ40 and Aβ42 aggregation [Figure 3]a and [Figure 3]b, disruption of Aβ40 and Aβ42 aggregates [Figure 3]c and [Figure 3]d, and reduction of Aβ secretion [Figure 4]c. %I and IC50 were calculated for all mentioned assays [Table 1], and additionally in AChE assay, Vmax(maximum velocity) and Km (Michaelis constant) were calculated in order to find the inhibitory pattern and to graph the Lineweaver–Burk plot [Figure 2]b. As shown in [Table 1], compared to the control, Tc extract treatment decreased Vmax and increased Km, indicating that Tc might be a mixed inhibitor of AChE. 200 μg/ml of Tc extract reduced AChE activity by 50% ± 9.4%. On the other hand, 25 μg/ml Tc prevented aggregation of Aβ40 and Aβ42 by 70.77% ± 2.62% and 57.32% ± 6.86%, respectively, whereas 60 μg/ml of Tc disrupted aggregates of Aβ40 and Aβ42 by 58.90% ± 2.26% and 31.21% ± 1.17%, respectively. Further, 25 μg/ml of the Tc extract also reduced levels of Aβ40 in HEK293 cells by 21.46% ± 3.48%. The Dunnett's test showed that inhibitory effect of Tc is significantly different from the control at α = 0.01 level for all the assays [Figure 2]a and [Figure 4]a-c]. Nag and Bratati, in 2011, reported IC50 of 10.96 μg/ml for methanolic extract of Tc fruits, and in 2017, Rajmohamed et al. reported the effect of ethyl acetate extract of Tc fruits on AChE with IC50 of 45.44 μg/ml. The differences in IC50 values of these studies, compared to ours, could be attributed to the use of different solvent systems and plant parts. Further, these studies have preincubated the AChE with plant extract before adding the acetylthiocholine (substrate) and second, they have used only one concentration of acetylthiocholine. While, we added the substrate and the plant extract simultaneously into the reaction to provide equitable competitive environment and besides we used eight different concentrations of substrate to find out the inhibition pattern. Having said that, we believe that the methanolic extract of Tc leaves most likely contain compounds with potent effect on AChE activity. In case of amyloid beta assay, a study by Wang et al., in 2013, showed that tanshinone I (TS1) and tanshinone IIA (TS2) inhibit amyloid beta aggregation process and disaggregate amyloid beta fibrils. Tanshinones are the compounds isolated from Salvia miltiorrhiza which are traditionally used for their anti-inflammatory, antioxidative, and anti-AChE effects. They reported the reduction of ThT fluorescence intensity by 88.5% for TS1 and by 83.4% for TS2 in case of amyloid beta-aggregation. They also reported that both TS1 and TS2 reduce the ThT fluorescence intensity by 30% in case of disaggregation of amyloid fibrils. It is important to note that they used compound versus Aβ peptide at a ratio of = 1:0.31 (3.22), while we used a ratio of = 1:1.7 (0.588) which means that they used a far greater ratio (5.47 times) of compound versus Aβ peptide than our study. It is clear that as this ratio rises, the inhibitory effect also increases. Having said that, we believe that, in addition to AChE-inhibitors, Tc also contains inhibitory compounds with appreciable effects against amyloid beta-aggregation. Liu et al., in 2012, assessed the effect of some medicinal plant extracts on Aβ production in cell line. They reported a range of 4% up to 26.9% of reduction in Aβ40 level in cell line while using 10–50 μg/ml plant extracts by ELISA technique. Considering that 25 μg/ml of Tc shows 21.4% of reduction in Aβ40 level in our study, which is quite close to their results, makes Tc an important plant to consider for further purification and isolation of Aβ40-reducing active compound(s). Pathologically, gradual amyloid plaque formation in the synapse slows down the action of acetylcholine, leading to the loss of communication between neurons. In order to increase the efficiency of acetylcholine in the brains of AD patients and to protect neurons from other effects of Aβ, it would be better if we could concentrate on finding new drugs with multitarget effects on different pathways related to AD which may increase the efficiency of the drug comparing to the side effects. Inhibiting AChE, reducing Aβ-aggregation, increasing disruption of Aβ-aggregates, and reducing Aβ-secretion would mean that not only more acetylcholine molecules would be available in the synaptic cleft, but also their movement would be facilitated and ultimately the message delivery would be faster. In Ayurvedic system, fruits of Tc have been used extensively due to their supposedly beneficial effects on different diseases, and besides, the fruit part has been found to modulate different biological pathways, including AChE-activity. However, nothing much is known about the leaf part. An IC50 of 200 μg/ml for AChE activity and much lower IC50 for Aβ40 and Aβ42 aggregation, disruption, and Aβ secretion indicate that methanolic extract of Tc leaves most likely contains some promising compound(s) that can potentially reduce various AD-precipitating mechanisms and therefore, this plant warrants further investigation in order to isolate and characterize the active phytoconstituents. Tc used by the Ayurvedic system and/or tribal healers for memory enhancement and anti-inflammation most likely contains considerable amount of active compounds with appreciable effect on biological pathways related to AD. Since this medicinal plant has been used for millennium, it is more probable that the active compounds might have better safety profile. Besides, since plant extracts possess different types of compounds, there might be more chances of affecting different biological pathways which means it might increase the benefit/risk ratio. Further purification and isolation of active compounds from methanolic extracts of Tc leaves might lead to compounds with multitarget effects on AD process. The work was carried out with the financial help of DBT Grant Sanction Order No. BT/232/NE/TBP/2011, Govt. India. Wolfson C, Wolfson DB, Asgharian M, M'Lan CE, Ostbye T, Rockwood K, et al. A reevaluation of the duration of survival after the onset of dementia. N Engl J Med 2001;344:1111-6. Walsh JS, Welch HG, Larson EB. Survival of outpatients with Alzheimer-type dementia. Ann Intern Med 1990;113:429-34. Chu J, Li JG, Joshi YB, Giannopoulos PF, Hoffman NE, Madesh M, et al. Gamma secretase-activating protein is a substrate for caspase-3: Implications for Alzheimer's disease. Biol Psychiatry 2015;77:720-8. Tomlinson BE, Blessed G, Roth M. Observations on the brains of demented old people. J Neurol Sci 1970;11:205-42. Mountjoy CQ, Roth M, Evans NJ, Evans HM. Cortical neuronal counts in normal elderly controls and demented patients. Neurobiol Aging 1983;4:1-11. Tabet N. Acetylcholinesterase inhibitors for Alzheimer's disease: Anti-inflammatories in acetylcholine clothing! Age Ageing 2006;35:336-8. Bartus RT, Dean RL 3rd, Beer B, Lippa AS. The cholinergic hypothesis of geriatric memory dysfunction. Science 1982;217:408-14. Hasselmo ME. The role of acetylcholine in learning and memory. Curr Opin Neurobiol 2006;16:710-5. Priller C, Bauer T, Mitteregger G, Krebs B, Kretzschmar HA, Herms J, et al. Synapse formation and function is modulated by the amyloid precursor protein. J Neurosci 2006;26:7212-21. Selkoe DJ. Alzheimer's disease: Genes, proteins, and therapy. Physiol Rev 2001;81:741-66. Selkoe DJ. Toward a comprehensive theory for Alzheimer's disease. Hypothesis: Alzheimer's disease is caused by the cerebral accumulation and cytotoxicity of amyloid beta-protein. Ann N Y Acad Sci 2000;924:17-25. De Strooper B, Vassar R, Golde T. The secretases: Enzymes with therapeutic potential in Alzheimer disease. Nat Rev Neurol 2010;6:99-107. Golde TE, Estus S, Younkin LH, Selkoe DJ, Younkin SG. Processing of the amyloid protein precursor to potentially amyloidogenic derivatives. Science 1992;255:728-30. Haass C, Koo EH, Mellon A, Hung AY, Selkoe DJ. Targeting of cell-surface beta-amyloid precursor protein to lysosomes: Alternative processing into amyloid-bearing fragments. Nature 1992;357:500-3.
de Paula VJ, Guimarães FM, Diniz BS, Forlenza OV. Neurobiological pathways to Alzheimer's disease: Amyloid-beta, TAU protein or both? Dement Neuropsychol 2009;3:188-94. Dall'Acqua S. Plant-derived acetylcholinesterase inhibitory alkaloids for the treatment of Alzheimer's disease. Botanics 2013;3:19-28. Houghton PJ, Ren Y, Howes MJ. Acetylcholinesterase inhibitors from plants and fungi. Nat Prod Rep 2006;23:181-99. Mukherjee PK, Kumar V, Mal M, Houghton PJ. Acetylcholinesterase inhibitors from plants. Phytomedicine 2007;14:289-300. Schulz V. Ginkgo extract or cholinesterase inhibitors in patients with dementia: What clinical trials and guidelines fail to consider. Phytomedicine 2003;10 Suppl 4:74-9. Howes MJ, Houghton PJ. Plants used in Chinese and Indian traditional medicine for improvement of memory and cognitive function. Pharmacol Biochem Behav 2003;75:513-27. Manyam BV. Dementia in Ayurveda. J Altern Complement Med 1999;5:81-8. Rajmohamed MA, Natarajan S, Palanisamy P, Abdulkader AM, Govindaraju A. Antioxidant and cholinesterase inhibitory activities of ethyl acetate extract of Terminalia chebula : Cell-free In vitro and In silico studies. Pharmacogn Mag 2017;13:S437-45. Rathinamoorthy R, Thilagavathi G. Terminalia chebula – Review on pharmacological and biochemical studies. Int J PharmTech Res 2014;6:97-116. Marquis JK. Pharmacological significance of acetylcholinesterase inhibition by tetrahydroaminoacridine. Biochem Pharmacol 1990;40:1071-6. Wilkinson DG. The pharmacology of donepezil: A new treatment of Alzheimer's disease. Expert Opin Pharmacother 1999;1:121-35. 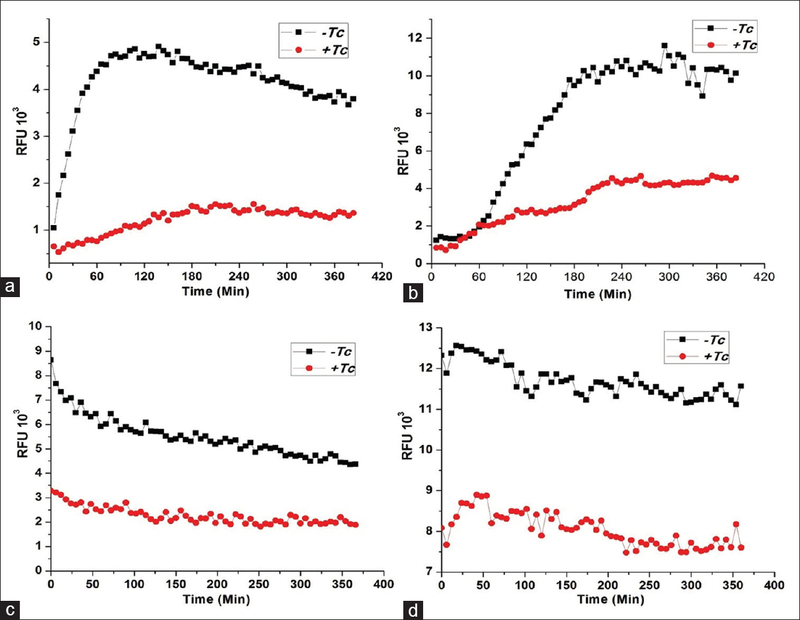 Hellstrand E, Boland B, Walsh DM, Linse S. Amyloid β-protein aggregation produces highly reproducible kinetic data and occurs by a two-phase process. ACS Chem Neurosci 2010;1:13-8. Haass C, Schlossmacher MG, Hung AY, Vigo-Pelfrey C, Mellon A, Ostaszewski BL, et al. Amyloid beta-peptide is produced by cultured cells during normal metabolism. Nature 1992;359:322-5. Nag G, Bratati DE. Acetylcholinesterase inhibitory activity of Terminalia chebula , Terminalia bellerica and Emblica officinalis and some phenolic compounds. Int J Pharm Pharm Sci 2011;3:121-4. Wang Q, Yu X, Patal K, Hu R, Chuang S, Zhang G, et al. Tanshinones inhibit amyloid aggregation by amyloid-β peptide, disaggregate amyloid fibrils, and protect cultured cells. ACS Chem Neurosci 2013;4:1004-15. Liu LF, Durairajan SS, Lu JH, Koo I, Li M. In vitro screening on amyloid precursor protein modulation of plants used in Ayurvedic and traditional Chinese medicine for memory improvement. J Ethnopharmacol 2012;141:754-60.